Totally addicted to oil, Man in his industrial adventure has transformed nearly all the Earth’s ecosystems into “egosystems” designed to serve only his own needs and desires, at the expense of all other species. He persists despite the irreversible damage he is causing to the environment. He has already disrupted the Earth’s thermostats. Western society has reached the “Age of Excess,” which will last only as long as there is still fossil energy to fuel it. The Earth cannot keep up with Man’s demand for natural resources. Her hydrocarbon reserves are shrinking rapidly and by 2010, global production will begin to decrease, setting off a period of unprecedented planetary disorder and turmoil. Today the United States must import most of the oil it needs from faraway countries. Therein lies a terrible paradox: the power of America is rooted in dependency! The free enterprise system that it is imposing on the rest of the world cannot solve this paradoxical situation; it will only amplify it and hasten destabilization. It is high time to wonder whether we in the West, in our suicidal quest for energy, are not running the risk of losing control of the course of our history. The invasion of Iraq by the United States military, in lockstep with American corporations, is a distressing and reprehensible step in this direction. 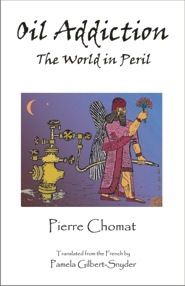 Pierre Chomat was a manager in the French petroleum engineering industry and actively participated in the development of oil facilities in a number of countries in Europe, Africa and Asia. He also served as a consultant to international companies in the energy sector. His professional expertise and personal knowledge of the Middle East and other oil-producing areas have given him a unique perspective on energy issues.